Installing a lift kit on a Ford Ranger does not have to be difficult and can really improve your ride and look. No Ford Truck Lift Kit – No Off Road Tires! Body Lift or a Suspension Lift, What is the Difference? Do Not Forget Your Tow Hitch! What can you do to get yourself on an even keel, so this type of roadway social fopa doesn’t happen to you again? How can you be the guy with the smug grin when you pass other truck owners in traffic? Its simple, get a Ford Ranger truck lift kit installed in your iron carriage, it is now much easier then you may think. 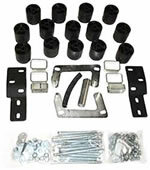 Truck lift kits now come in a wide choice of styles. In fact, you can now buy a kit that is so simple to install that you can do the installation work yourself in your driveway in one afternoon! How does that sound, great right? 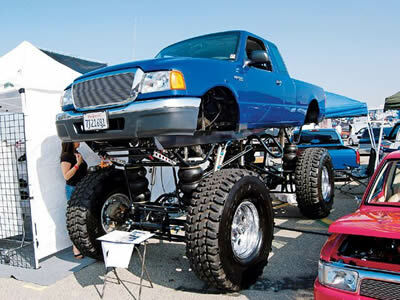 Of course, we are talking about a basic lift kit that would enable you to do light off roading, but if you have something more extravagant in mind, or really want to tower above fellow truckers you are going to want to go for a beefier lift kit. 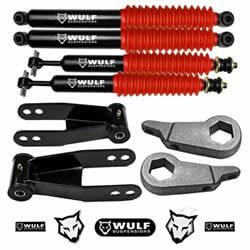 The video below shows a Wulf suspension lift being installed on a 1999 Ford Ranger. Don’t even think about getting large off road tires fitted without lifting your pickup first. If you do, you will end up with tires that rub on the inside of your wheel wells, which will drive you nuts. Even smaller off road tires will rub when you go over speed bumps and make sharp turns. The good news is that you are no longer at the mercy of high priced specialty truck and off road shops. 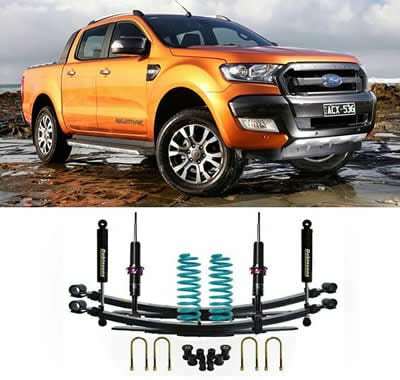 You can easily find a huge assortment of Ford Ranger truck lift kits online at really competitive prices, so there is no excuse not to lift your ride. Which type of lift is best for your truck? Do I really need one? What about my tow hitch, do I need to do anything to still use that for my boat trailer? Should I replace my sway bars and track bars? These are all great questions and things you should consider before buying a Ford Ranger lift kit. We hope this guide helps you find the right kit for your pickup truck and we would love to see some pictures once you are done! So, you’ve made the decision to lift your truck, but there are so many options, how do you know which one is right for you and your vehicle? A body lift lifts only the body from the frame using blocks or spacers. It is generally a 1″, 2″, or 3″ lift and is less expensive than a suspension lift. It does not increase ground clearance but keeps the center of gravity lower than a suspension lift. The lifted body raises the wheel well and allows for slightly larger tires. 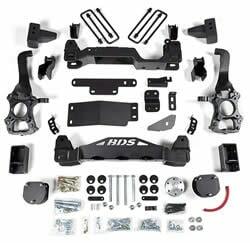 I would recommend this kit to someone who wants the lifted look but doesn’t plan on doing a lot of off-roading and wants to save some money. This video shows you step by step how to install a body lift with spacers or blocks. A suspension lift is generally preferred by offroaders because it offers better handling and ground clearance. You can get a suspension lift as high as 18 inches. 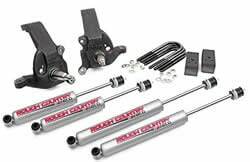 Steering stabilizers are usually needed as well as brake-line extensions with the higher lifts. 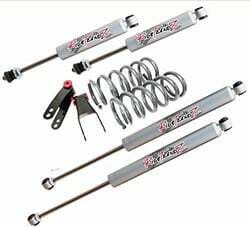 This type of lift raises the suspension of your vehicle by replacing the front and rear leaf springs and shocks. Springs are used to raise the frame, body, engine, and power train above the wheels. This allows for much larger tires. Truck enthusiasts define truck lifts as a system that uses springs to raise a vehicle. 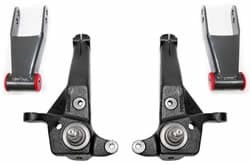 The simple process involves heightening or suspending the power train of the wheel, frame and body of the vehicle to a desired height to improve offload performance or create ‘the look’. Generally speaking, most folk want to lift their truck to add some comfort to the ride when offloading, others to make it look good. There is nothing wrong with making your pickup truck look awesome, at Pickup Truck World, we love a good raised truck both for off-road and for cruising down the highway. Truck enthusiasts definitely want to make heads turn. They monster-size their rigs with a beefy truck lift kit for imposing style and impressive handling. If you intend doing any serious off-roading, you will want to raise your ride with a lift kit, specifically designed for your specific Ford Ranger pickup truck. By simply lifting your truck, you will obviously gain additional ground clearance, which means that the underside of your truck is protected from sharp rocks, inclines, and anything else in your path (obviously within reason!). If you have ever heard that scraping sound as you have bottomed out either going up a steep driveway or having some off road fun, you will have cringed wondering what damage you have caused to your vehicle. Even a small lift to your truck will make all the difference and perhaps save your oil sump! With the perfect lift kit, you’re free to tackle even the toughest trails. Suspension upgrades gain you clearance for bigger tires, control for adverse terrain, and stronger parts to handle the abuse of real-world off-roading. Unfortunately, lift kits are also complicated systems, so be careful, and be sure to choose a system which is well engineered for safety and performance. Also remember, if you intend to install this yourself, you need to find a kit which is easy to install. Don’t forget that by changing the height of your pickup truck, it can effect how you use it in the future. For instance, adding a lift kit and larger than stock wheels and tires can affect the vehicle’s tow hitch. You may now need a new rear bumper because of the change in ride height. Also, in some extreme cases, the trailer tongue can’t even reach the hitch. With long trailers, such as a four-horse stock trailer or a boat trailer, you may be able to mate trailer and hitch, but the trailer angle from front to back could be enough to cause the trailer to scrape the rear end on the road. With factors like these to consider, you need to put some thought into the height you want to lift your truck and what you use it for now and plan to use it for in the future! Truck lift kits can give your 4X4 or 2WD vehicle an off-road look to complement your style. But, for the best rough country experience, additional off-road truck parts including beefier 4X4 wheels & tires, variable rate coils and brake upgrades can add value to your ride. Suspension Lift Kits – If you are a serious off roader, you will want to use a suspension lift kit to improve your 4X4’s maneuverability. 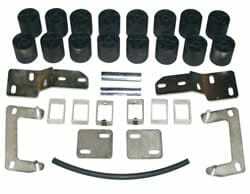 If you are only trying to increase your 4X4 wheels & tire size, an less expensive body lift kit may do. 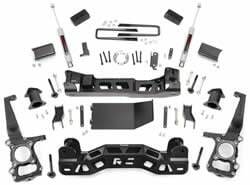 Body Lift Kits – If you only need a couple of inches of wheel well clearance for larger 4X4 wheels and tires, an inexpensive body lift kit may be the right truck lift kit. 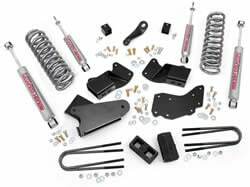 Body Lowering Kits – If looking to add high performance low-profile street wheels and tires to your sports truck or SUV, suspension lowering parts and kits designed to enhance the low-rider appearance and road performance are what you are looking for. 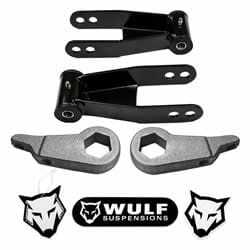 Sway Bars & Track Bars – Once you’ve equipped your truck with a lift kit, sway bars and track bars are useful parts to fine tune the handling of your truck, jeep or SUV for on and off-road driving. So you have lifted your truck, what size tires should you buy? The below table should help you make the right choice for your pickup truck. Question – Why is rear height of my truck lower than the front? Answer – Most pickup trucks come out of the factory with the rear a couple of inches higher when empty than the front. The reason for this is so your trucks rear end is not too low when fully loaded. If you are lifting your truck, you will be more concerned with performance, tire clearance and how your pickup looks. Having a level suspension will improve handling when not carrying a load as the unladen weight distribution is generally better when levelled out front to back. 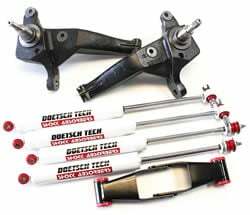 Note – most kits give you the option of altering rear lift height and / or method.